Type on any computer, phone and tablet with one keyboard*. Easy one-button switching between three connected devices. Full-size familiar layout for comfortable easy typing. Integrated phone and tablet stand. Easy wireless connection via included USB receiver or Bluetooth Smart wireless. Works with Windows, Mac, Chrome OS, iOS (iPad, iPhone) and Android devices. 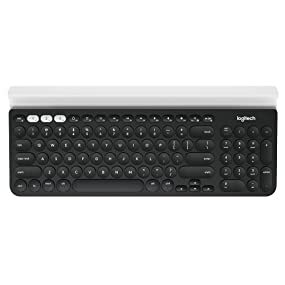 Enjoy quiet, comfortable typing, on your Windows PC or Mac, and switch typing to your phone or tablet at the touch of a button. 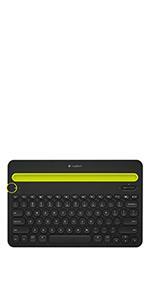 An integrated rubber stand holds your mobile devices within reach and always at the perfect typing angle. Type. Switch. Go. 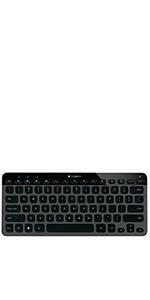 * USB-equipped or Bluetooth Smart ready device that supports an external keyboard (HID profile). ** Battery life calculation based on an estimated two million keystrokes per year in an office environment. User experience may vary. Start typing on your computer, then type on your phone or tablet at the touch of an Easy-Switch button. 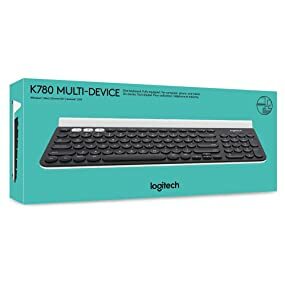 It’s compatible with Windows, Mac, Android and iOS and gives you a choice of easy wireless connections—included USB receiver or Bluetooth Smart technology. 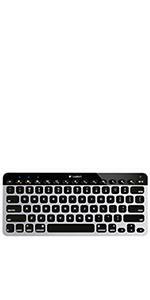 It’s a super-smart keyboard that recognizes each device and operating system and automatically maps keys to give you a familiar layout with your favorite hotkeys and shortcuts. Windows 7, Windows 8, Windows 10 or later.